Although UEFA Europa League qualification proved a bridge too far for Dieter Hecking's Borussia Mönchengladbach in 2016/17, the former Nürnberg and Wolfsburg head coach was reasonably satisfied with his first six months in the Borussia dugout. Click to see who made it into the Bundesliga Team of the Season! Click here to download the free official Bundesliga app! bundesliga.com: Dieter Hecking, Borussia enjoyed a solid second half to the season, collecting 28 points, but do you feel you could have had more? 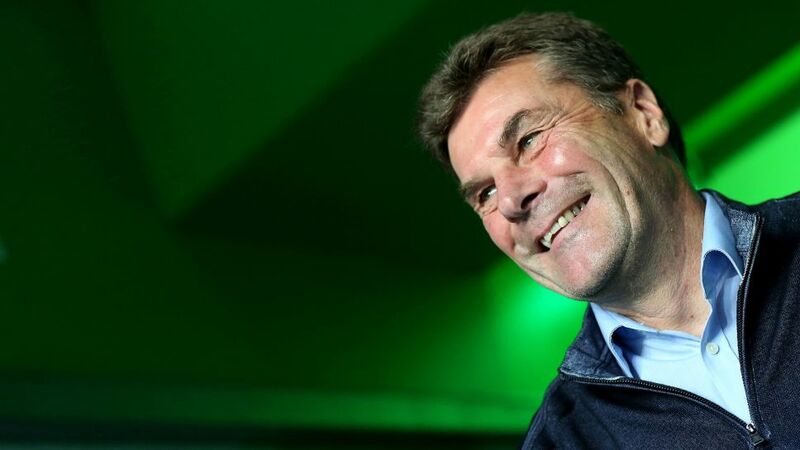 Dieter Hecking: Those 28 points were actually a good yield in that time frame. If you are averaging those figures during the entire campaign, it would equate to at least a Europa League place. But it's true that things could have been better given our last three matches [three draws]. However, to have achieved more, we needed all of our players fit [which wasn’t the case], especially given that at one point we were playing more games than anyone else. Our quality suffered because of those absentees, not least during training. bundesliga.com: Borussia reached the Europa League round of 16 and the semi-finals of the DFB Cup. Was there just too much of a burden in terms of the amount of games? Hecking: No. We played some very good matches in all competitions. What happened was, at some point, you felt that mental edge - or mental freshness - diminishing. You can’t forget the major disappointments we suffered when knocked out of the Europa League and the DFB Cup. In both cases, we were by no means the worst team but in key moments luck was simply not on our side. bundesliga.com: In Mönchengladbach, despite the international competition for signings, it has been possible to keep your first-team regulars on a long-term basis. How does that feel for a coach? Hecking: Max Eberl [Gladbach’s director of sport] has always tried to maintain a very solid structure in terms of the squad here. If players like [Christoph] Kramer, [Yann] Sommer, [Lars] Stindl, [Tony] Jantschke, [Ibrahima] Traore etc. are all at their peak, it makes sense to speak with them about contract renewals, especially as they are very comfortable in Mönchengladbach. These players are completely satisfied with the work that is being done here. When you find a community like this, of course it makes things easier for the coach. The team may not quite have reached their aims this season, but the motivation to improve next time is there. bundesliga.com: Does the team still need fresh blood? Hecking: Of course. You must always look to see if a change in a position would be good. However, the overall relationship within the squad is very good here, so I can say that we're not planning a major shake-up. bundesliga.com: With defender Andreas Christensen’s loan deal over, are you happy with Timothee 'Kolo' Kolodziejczak – who has played just nine minutes in the Bundesliga – coming in to feature prominently in defence? Hecking: Kolo was unfortunately injured for quite some time. In Andreas Christensen and Jannik Vestergaard we had two central defenders who enjoyed a good understanding, so change wasn’t essential in that area. That Andreas has gone opens the door for Kolo to play more in the future. bundesliga.com: Who could make the jump to first-team prominence at Gladbach next season? Hecking: We certainly have one or two young players who have potential to step up. [The 19-year-old midfielder] László Bénes – who played very well in recent weeks – is one of them. Also, defender Mamadou Doucouré hasn’t been used as yet because of injury but we’re hoping he enjoys a problem-free pre-season. I am sure that there will be a couple more who can have a bright future here. bundesliga.com: RB Leipzig as runners-up, Hoffenheim finishing fourth and Freiburg qualifying for Europe – what have you made of the recently ended Bundesliga season? Hecking: These were certainly striking developments and obviously positives for the clubs concerned. Of the promoted teams, I judge Leipzig’s achievement differently to that of Freiburg’s because it was clear to me that the former would be nowhere near a relegation fight and more likely to be challenging for Europe. Having said that, that they managed to finish second in their debut Bundesliga campaign is an outstanding achievement. In Hoffenheim, it's an example of being involved in a tough fight against relegation at the end of one season and then, conversely, being successful the next. Hecking: For me, Freiburg have again done spectacularly well. When you consider the gap between their achievement and the reality of their situation; in those terms, they had the greatest impact. bundesliga.com: Winning the DFB Cup and finishing as a Bundesliga runner-up with Wolfsburg earned you the coach of the year title two years ago. Who do you see on the current shortlist for that accolade this time around? Hecking: Since I’ve already praised Freiburg, it is logical that I sound out Christian Streich. However, my vote [for the best] would go to Julian Nagelsmann [of Hoffenheim]. But there are others too, that one could highlight. Click here for more news on Gladbach!